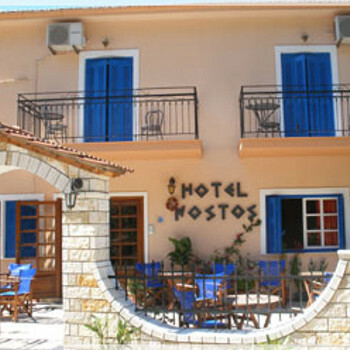 We have just returned from a fantastic week at the Nostos Hotel. This was our first trip to Ithaki, which we arranged independently, greatly assisted by Nicki who organised our taxis and speedboat transfers over from Kefalonia. Everything went smoothly and we can thoroughly recommend arriving on the island by speedboat - apart from the short journey (15mins) it was a great start and finish to the holiday! We were made thoroughly welcome by Nicki and Andreas who did their utmost to ensure that we had an enjoyable stay with them. Our large room consisted of a double and single bed and was most comfortable with a lovely balcony overlooking the pool, bar and surrounding area out to sea. Breakfast very tasty and plentiful - the best my husband had ever enjoyed on a Greek island! We spent most days exploring the island either by moped or hire car - which is easily organised through the hotel - ending up with a dip in the glorious pool and a cool drink served by their friendly son Luca. We chose to eat our evening meals in the restaurants either in Frikes harbour, which is a short stroll down from the hotel, or in Stavros village, a 5min drive or 30min walk. The views around the island are absolutely breathtaking - and finding our own private bays to snorkel and laze in the sunshine was amazing! Can thoroughly recommend spending the morning sitting in Kioni harbour with a freshly squeezed orange juice whilst watching the comings and goings of the fishing boats and yachts. This was a trip that will stay with us for a long time and we hope to return soon to the island and most certainly back to the Nostos!